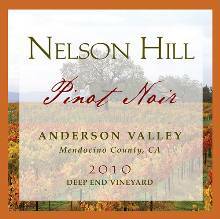 The 2010 Anderson Valley Pinot Noir instantly appeals with its beautiful deep garnet color and nose of delicate spice with underpinnings of earthy terroir. The palate will delight in the flavors of dark cherry, boysenberry cobler and plum with notes of chocolate. This wonderfully balanced wine continues to please with its long, silky, memorable finish. Everyone's favorite, this vintage was awarded a Gold Medal and 92 points (Exceptional). The 2010 vintage will make almost any meal a special occasion.